It seems like Autumn can't make up its mind. Many trees are already changing color and there have been a few cool days, although summer pleasantly keeps lingering. Yesterday was as sunny as it could get, and it felt over 70 degrees, not exactly what you would expect from a Fall day, giving us the best reason to lounge outside on our balcony. If you read my blog you may remember how my balcony used to look like, bottom picture. I painted the floor and walls in two different shades of gray which I see more as a neutral color. Then, my adorable hubby covered the spaces between the side wood with pieces of stud, not to make it look like diamond lattice trellis, but to close it, that's why the pattern may look a little quirky to you. I'm glad Fall is still wavering. 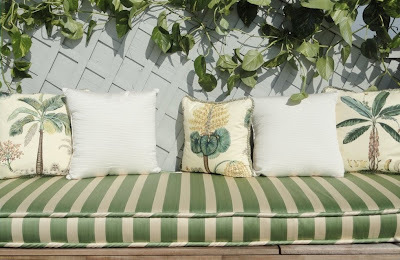 You have read this article snippets of my home with the title Our outdoor space, After. You can bookmark this page URL http://ourpicturewindow.blogspot.com/2010/10/our-outdoor-space-after.html. Thanks! No comment for "Our outdoor space, After"